The NCAA indoor championships kick off tomorrow afternoon in Albuquerque, New Mexico. We here at the Daily Relay will have our own special way of covering it. The thing that makes the NCAA meet such great fun is that not only is it a bunch of individual competitions but two big team competitions as well. Can Oregon win their fifth straight women’s indoor championship? If not, who will knock them off? Which SEC team will win the men’s title–or will an outsider pull off a huge upset? Each individual event will have some affect on the outcome of the team championship and we’ll keep you updated as to how that happens. I have projected how many points the top teams will score in each event, which gives a predicted final team score. After each event I’ll update the projected final scores. This way you can see who’s moving up and who’s falling back. I’ll post these updates via Twitter, so make sure you’re following us. Here are my current projected final scores. Remember, the top four teams win trophies. The point is not whether these are correct or not–they won’t be–but rather that the trailing teams are going to have to do better than expected in order to move into contention, and we’ll see how that happens over the weekend. As far as other info goes, the USTFCCCA’s National Championship Central has literally everything you could ever need: TV schedule, webcast links, start lists, live results, meet history, and more. Pat Price puts the 5 Questions to Todd Williams, America’s best long-distance runner in the 90s who still holds the national record for the 15k. Runner’s World’s Morning Report has all of yesterday’s news: the New York Road Runners’ bonuses for Olympic Marathon Trials qualifiers, Caleb Ndiku’s busy agenda, and more. Ken Goe’s daily Oregon track & field rundown: the Ducks aren’t worried about the high altitude in Albuquerque. The USTFCCCA previews the entire weekend of NCAA Champioinships–all three divisions–in their Warm-Up Lap. Ryan Vail has been called up for jury duty at the same time that he’s supposed to be traveling to England for the London Marathon. Peter Gambaccini has the story of his attempt to get a deferral. Scott Bush has kicked off a new series at RunnerSpace.com: TF 365, in which he’ll interview a different top athlete each day for an entire year. 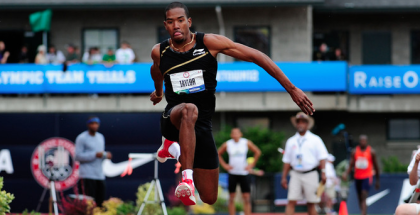 Yesterday it began with long/triple jumper Christian Taylor, an Olympic and Diamond League champion. 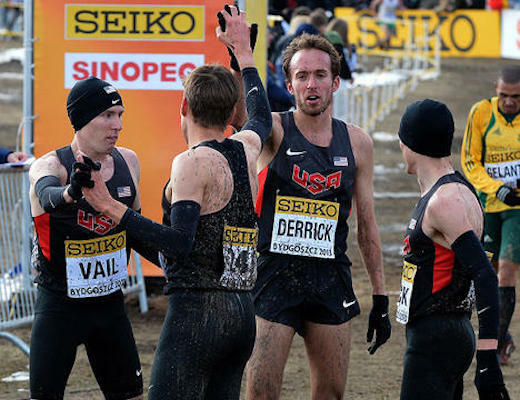 Today’s TF 365 entry is the reigning USA cross country champion, Chris Derrick, who is trying his hand at the road 15k this weekend. The Road Runners Clubs of America has announced this year’s Hall of Fame class: Anne Audain and Ken Martin. Canadian news: national record holder Jessica Zelinka is returning to the heptathlon in 2014 (after spending 2013 on just the hurdles), and has a new home and new coach. Spikes Magazine gives us nine things to know about Kiwi Tomas Walsh, the surprise shot put bronze medalist at the World Indoor Championships. There’s tons of stuff going on this weekend, and you can watch most of it from the comfort of your own home. The NCAA Division I Indoor Championships will be live at ESPN3.com from 7:55pm ET on Friday and 7:50pm ET on Saturday. The NCAA Division II Indoor Championships will be live at NCAA.com from 2:55pm ET on Friday and 3:55pm ET on Saturday. The NCAA Division III Indoor Championships will be live at NCAA.com from noon ET on Friday and 11:00am ET on Saturday. The New York City Half Marathon will be live at ESPN3.com from 7:00am ET on Sunday. 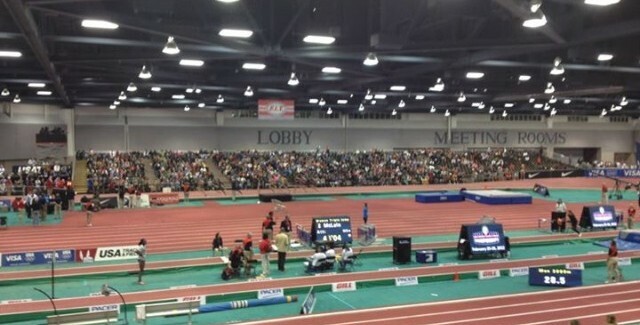 The New Balance Nationals Indoor, the national high school championship, will be live at USATF.tv from 9:00am ET on Friday, 8:30am ET on Saturday, and 8:30am ET on Sunday. The Sydney Track Classic will be live at Athletics Australia from 4:50am ET on Saturday. The Athletics Canada Indoor Open will be live at Trackie.ca from 6:00pm ET on Friday, 9:00am on Saturday, and 9:00am on Sunday. The SEC Indoor Championships will be rerun at 5:30pm today and 7:00pm on Sunday on ESPNU. Prefontaine (1997) will be on The Movie Channel beginning at 10:30am on Monday. The BBC’s short documentary on Jamie McDonald, a British man who ran across Canada–a 5,000 mile journey.